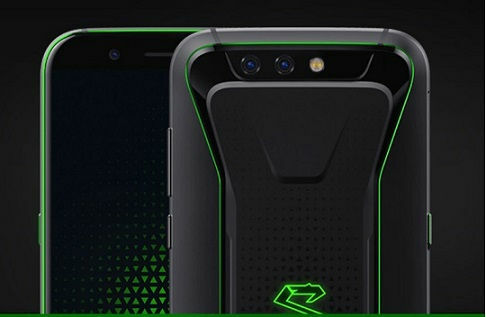 After a long wait and lots of teasers and leaks, it’s finally live, the Black Shark gaming smartphone. Xiaomi-backed Black Shark company has today launched the much-awaited handset focussed on gamers and that’s why it is equipped with very impressive hardware specs along with a liquid cooling system to avoid heating of the device. The smartphone launched today in China. The pre-orders now open price starting at CNY 2,999 (roughly Rs. 31,100), and it will go on sale starting April 20. It is available for order on Xiaomi’s China site, YouPin e-commerce site and also listed on JD.com. Right now there is no word on the global availability of the handset. The Black Shark design is in line with the teasers released earlier featuring the green and black colored design aesthetics as that of the Razer Phone. The smartphone has got Bluetooth 4.0 support and a gaming controller as well which the company has introduced too. The gaming pad (controller) comes with a joystick and a trigger button and it can be attached to the handset. It is priced at CNY 179 (roughly Rs. 1,900). The company is also claiming that there is an X-type antenna, ensuring connectivity whether held in landscape or portrait and avoiding the ‘grip of death’. There are two models of the gaming smartphone based on the RAM and Storage; 6GB RAM/64GB storage and 8GB RAM/128GB storage. There is a 5.99-inch full-HD+ (1080×2160 pixels) screen and the handset is driven by the Qualcomm Snapdragon 845 chipset with Adreno 630 GPU. It bears a dual camera set up at the rear in a combination of a 20-megapixel sensor and a 12-megapixel sensor, while also houses a front camera with a 20-megapixel sensor with f/2.2 aperture. There is a 4000mAh battery which seems good enough. For connectivity, there is 4G LTE, Bluetooth 4.0, GPS, AGPS, and Glonass.